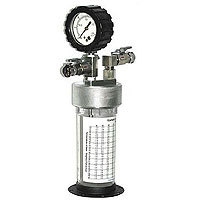 The Taprite 2701-BCT Carbonation Tester is designed to be used in the field to verify carbonation levels during equipment installations, keg change-outs and to assist with trouble-shooting. 1. Keep this thing in the walk-in, it really needs to be cold. 2. Take three readings and average them. 3. Run about a gallon of beer through this thing, it really needs to attemperate to the beer. one gallon, at least. 4. Shake it for at least 6 minutes. 5. Save your money for the real deal.